A few days ago I gave a talk “Explore Egypt with Google Earth” here in Cairo at the Dutch-Flemish Institute. How to bring a semblance of structure to such a topic? The talk would not just be a good opportunity to show off Egypt’s charms using Google Earth; it would also a great way to show of Google Earth’s capabilities using Egyptian-themed content. Two ways into the talk… I felt a table coming on. It’s remarkable how quickly I found 25 different relevant items; even with each item getting on average only two minutes of limelight, my talk easily filled the hour. I ended up doing my talk row by row, rather than column by column, but I think either works depending on the audience. And of course, this format could work with any country — just do a search on Google Earth Community and on a couple of the Google Earth blogs and KML repositories for a country name, and you should have a good selection. I also used some default layers and global content that is relevant to any country. Craters: New crater discoveries in Egypt is one boon of free access to large amounts of satellite imagery. Daily MODIS imagery including of Egypt. Coral Reef monitoring: Monitor damage to coral reefs in the Red Sea. Tracks4Africa (Default Gallery): A remarkably accurate crowdsourced mapping initiative for a continent often lacking good maps. Amarna – new sites (GEC): Free satellite imagery helps archaeologists scour the region for new finds. 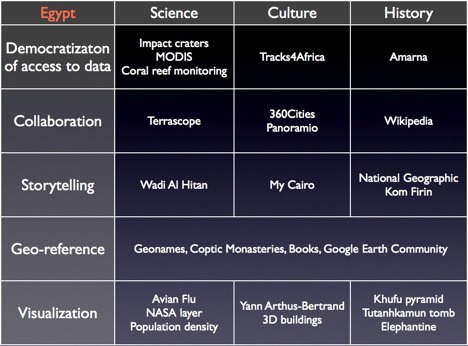 Terrascope: Help catalog large scale changes to the Earth’s surface in the past 30 years. I’ve added some new lakes in Egypt. 360Cities: Great panorama shots of Egypt. Wadi Al Hitan: Exploring a paleolithic site with GPS and a camera. My Cairo: A collection of walks with georeferenced photos from Cairo. Kom Firin: An archaeological dig in the Nile delta. Geonames: The first line of attack for identifying places in Google Earth. Books (Default Gallery): Despite its rough edges, this layer works remarkably well on villages along the Nile, because every 19th century explorer of these parts mentions these towns. Google Earth Community (Default Gallery): The first line of attack to identifying objects in Google Earth. Avian Flu: Via which route did bird flu arrive in Egypt? NASA Layer (Default Gallery): I used the example in the desert near the Sudanese border, where you can see an irrigation project expanding. Population density (Default KML Gallery): See where Egypt’s population is concentrated (no surprises). Yann Arthus-Bertrand: Georeferenced photos, but also “geopositioned” photos. Elephantine, by the German Archaeological Institute and the Vienna University of Technology: I left the best one ’til last. But this one needs a whole post to itself — coming up. Sounds like a great talk, Stefan. Thanks for sharing your content and the great links. I’ll try this with other places. Thanks for posting Stefan. How about adding two more columns for “government” and “business”? I am always very much fascinated by the mysteries of Egypt.One has to visit Egypt atleat once in life time, i dont think watching it through google earth will be so interesting.